Light is one of the most expressive accessories you can add to just about anything, ranging from your car to your own persona. It is usually synonymous with the concept of power. This expression and use are so common, in fact, that light is commonly used to differentiate between good and evil. How many times have you associated a certain glow with the forces of good and evil in a movie or cartoon? Sometimes, the hero is surrounded by a white or blue light while the villain is either enshrouded in darkness or surrounded with a red glow. Sometimes it is a golden glow for good and something different, maybe green, for evil. You can’t deny that the basic idea behind those depictions is pretty accurate. We associate light, at the very least, with our emotions. As such, we can use it to express and evoke certain emotions. It isn’t so much the fact that there is light as it is the fact that that light glows in a certain color. Red, for example, has often been associated with love and danger in equal numbers of situations. When it comes to your vehicle, you might want your vehicle to give out some kind of message as you drive it down the highway. You might want to be a good citizen and evoke emotions of love in the pedestrians that see your car. Perhaps you might want them to feel happy. Or maybe you might want to get them into a somber mood for a while, so they can contemplate some of the more serious aspects of being alive. 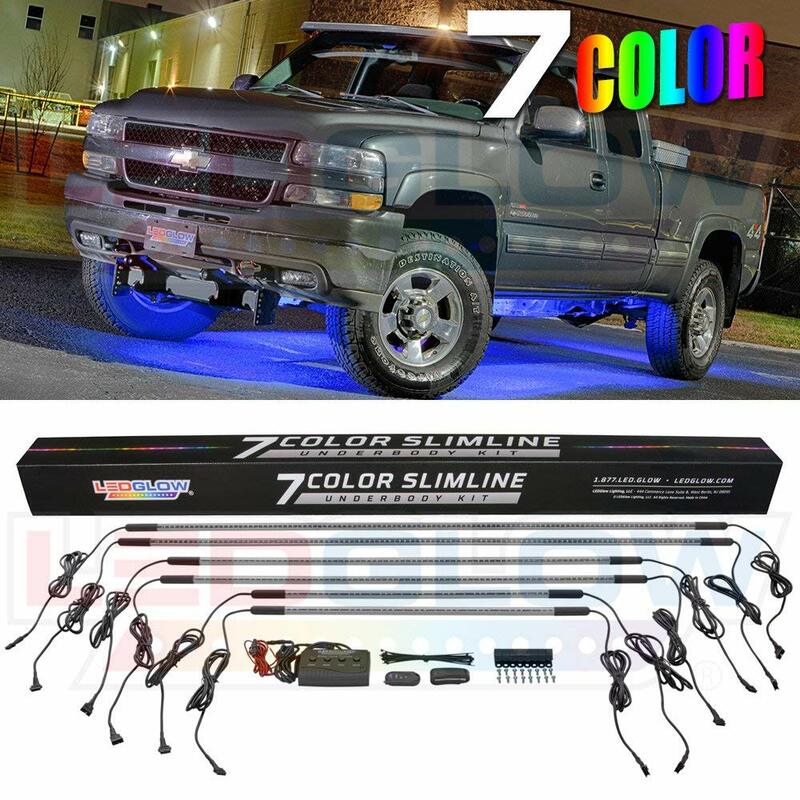 An underbody underglow kit is also commonly known as ground effects lighting and it is an aesthetic customization you bestow upon your vehicle long after you drive it out of the car dealer’s showroom. In other words, it is an aftermarket customization. Basically, it is a series of lights that is attached to the chassis of the car and illuminates the ground below the car. There are two main kinds of underglow lighting: Neon lighting and LED lighting, where LED stands for Light Emitting Diode. Neon underglow lighting has one major advantage over LED underglow lighting: it is very bright. A neon underglow kit will make sure everyone on the road sees and feels the very message you are trying to get out there with your lighting. On the other hand, it also has a great disadvantage, which makes it an especially expensive choice when it comes to underglow lighting choices: the tubing used in neon underglow kits is quite fragile. If you’re going to be driving your vehicle on rough terrain where the underside of your car is likely to get scratched frequently, then the last kind of underglow lighting kit you want to get is a neon kit. Even a slight bump could mean you’re back on the market looking for an underglow lighting kit to replace the one you just lost to the road. The installation process for a neon kit is about as simple as bolting the lighting assembly to the chassis of the car and wiring a transformer into the car while you’re at it. 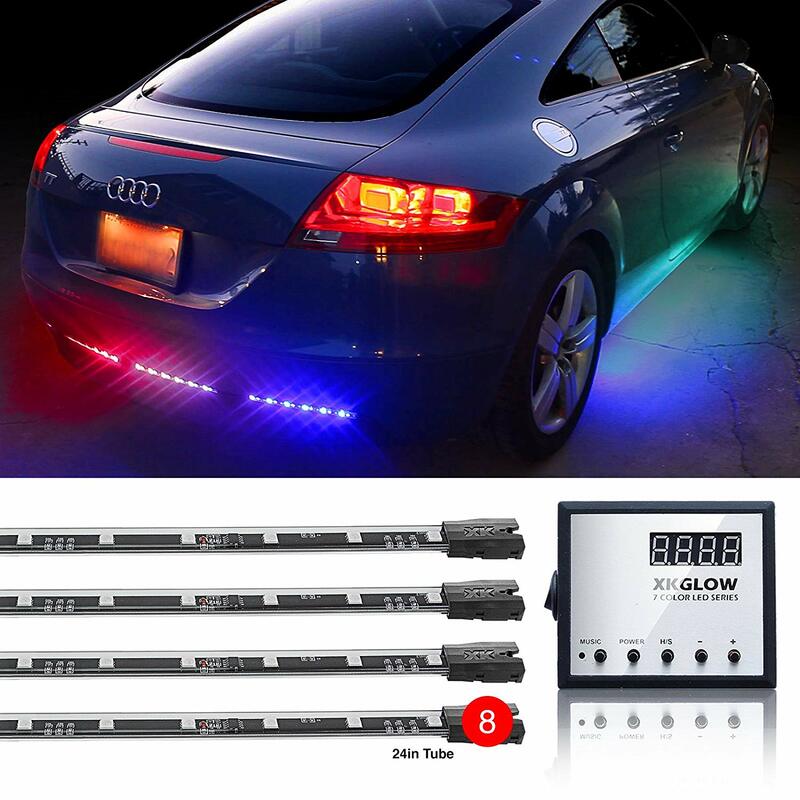 There are also special modules that come with some neon underglow kits where you can wire the kit to your car’s audio so that the lights change in step with the beats of your music. That’s the height of cool in our book! LED underglow kits are a lot more durable and resilient than neon kits. They are also more compact and not as bulky. LED is basically a kind of lighting that uses semiconductors and a lot of solid state physics to produce light, as opposed to the hot-gas-in-a-glass-tube method that neon kits use. LED lighting will also be more economical with your battery’s energy and resistant to vibrations. These lighting kits can display a wide variety of complex patterns, including fading effects, chase effects, and strobe effects. You can also mount them in all the most normally inaccessible nooks and crannies of your vehicle, such as the interior, the air-intake scoops, and the engine bay. You could pretty much install them behind the wheel wells if you wanted. With additional wiring, the LED can be wired to respond to the car’s RPM or sound system. There are special LED lighting systems that are submersible in water, making them perfect for trailers that need some kind of illumination for the road during snowstorms and heavy rains. Remember, it’s not just about aesthetics here; safety matters too, and that’s what you’re getting with an LED underbody underglow kit. Sometimes it’s not even about you being able to see the road ahead of you in low visibility conditions. 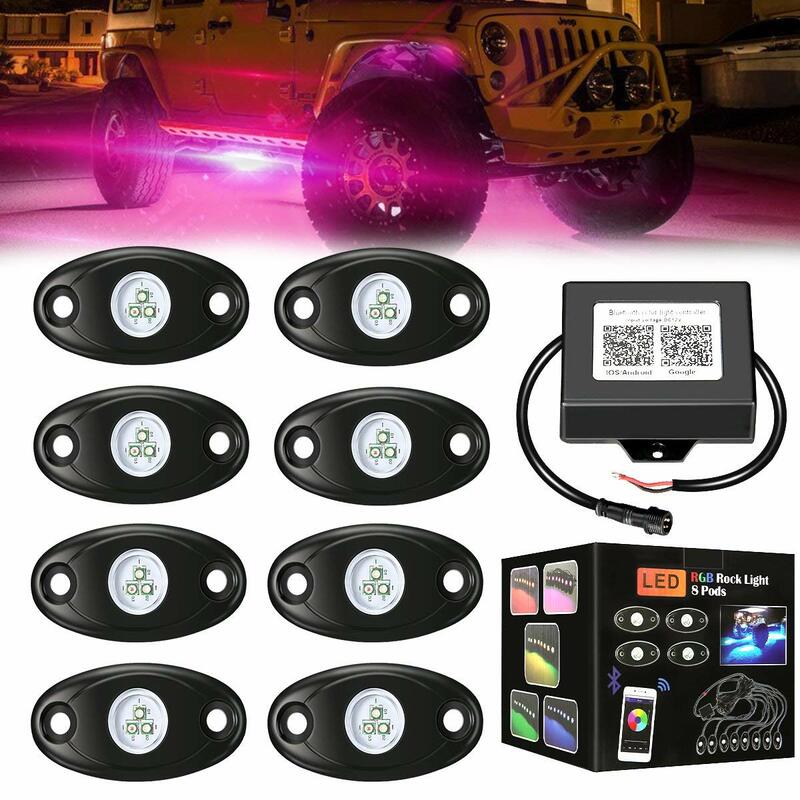 A nice and bright underglow lighting kit will illuminate your vehicle so pedestrians and other drivers nearby know exactly where you are, no matter what the visibility. Think of them as a light vest; one that glows around for 360 degrees. When it comes to picking an underbody underglow kit, you want the perfect one to have a few things that you simply cannot skimp on. Beyond that, you want the kit to have some other features that, while you certainly do not entirely need, will certainly turn you into the king of the road. The Ambother 1959 kit delivers all of this and more. Let’s start with the fact that it can be controlled via Bluetooth. Nothing speaks control quite like an underbody underglow kit that you can operate from many feet away. Whether you are in your vehicle or outside of it, power is completely in your hands and you are capable of exercising it through something as simple and ubiquitous as your smartphone. Luckily, or perhaps by design, this underbody underglow kit is compatible with both Android and iOS systems. The other beautiful thing about this kit is its ruggedness. If you want an underglow kit that is going to stay strong, even when you’re driving on rough terrain, then you can hardly go wrong with the Ambother 1959. The rugged design will closely hug your vehicle and withstand even the toughest of terrains to give you 50 thousand hours of dedicated service. If you want even more control, how about being able to change the speed at which the colors change, giving your LED lights whatever character you wish. You can also change the brightness, making them so bright they dazzle everyone that dares to behold them, or just bright enough to be noticed but not so bright as to be annoying. You can also control the strobe effect on the lighting to suit whatever your preferences are. The strongest suit of this lighting kit by far is its ruggedness and durability. It offers you pretty much the same level of control as what you would get with other brands on the market but it is also rugged enough to stay with you through the toughest of terrains. Something you will notice about this list is that the top positions are occupied by Ambother products. That’s because these are some of the best underglow kits out there, commanding the respect of customers and the envy of competitors. That said, the Ambother 1845 comes with some excellent features and does not fail to impress as is Ambother tradition. The first feature is that this kit comes in a pack of 4 strips. With LED lighting kits, what you want is something that can easily wrap around the vehicle and other areas, making for a 360-degree lighting experience. 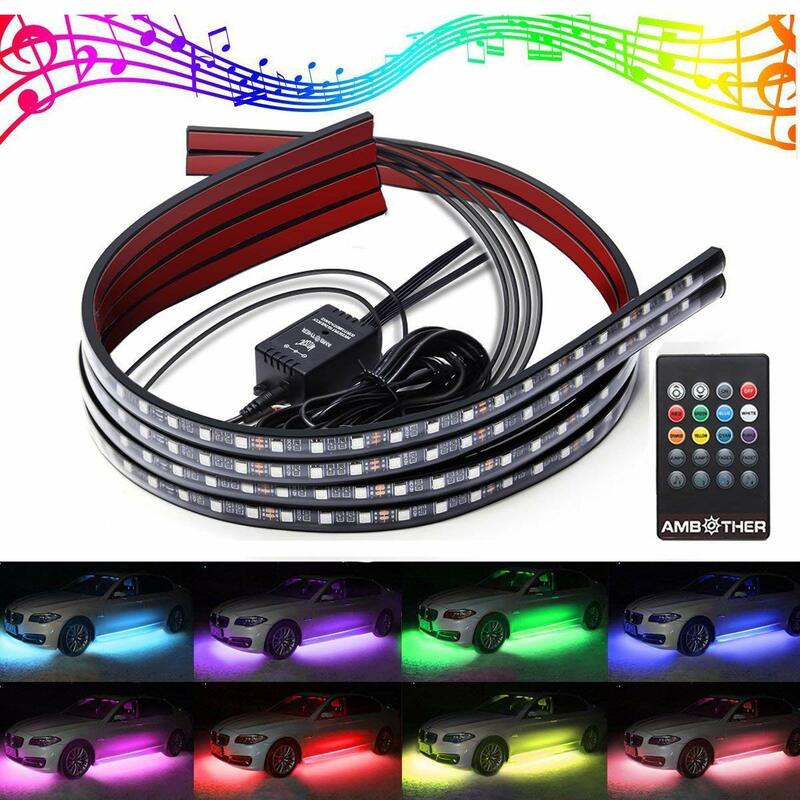 The 4 LED strips that come with the Ambother 1845 LED underglow lighting kit are very easy to install and can be put on the 4 major sides of the car’s chassis. The strips are also quite flexible, which speaks to another great need when it comes to underbody underglow kits. You want a flexible strip of lighting so you can easily bend and stretch it to match the natural contours of your vehicle. That way, the lighting looks a lot more natural coming from the vehicle. 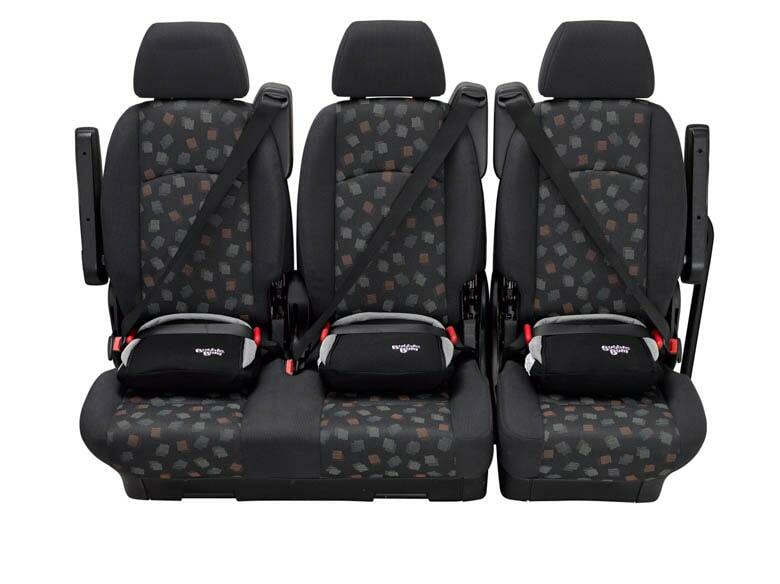 The strips on the Ambother 1845 are highly flexible and easily fashionable so they fit the contours of the vehicle. That’s actually part of the reason why they come in 4 long strips. It’s much easier to get a long strip to obey the contours of the vehicle than lots of component strips. Besides, it makes for much better continuity and a much more pleasing appearance. For that reason, if no other, this particular model is an excellent fit for a wide variety of car models and truck models. Here is something you will definitely appreciate when you’re picking out LED lights: waterproof tubing. Imagine being able to install your underbody underglow kit and not have to worry about the rain or any snow storms you may encounter on the way. That is something any driver will appreciate. However, the drivers that will appreciate it the most are those who deal with trucks, who not only need a form of lighting to illuminate the road around them during low visibility conditions but also want something that is capable of withstanding harsh and wet weather conditions. The LEDGlow Slimline series comes with 324 LEDs that are ultra-bright. That means you will pretty much bathe the road or asphalt underneath your car in lights of many different colors. They also come in waterproof tubing to withstand any kind of wet conditions on the road. One thing that’s pretty interesting about this underglow lighting kit is the number of different tubes that come with the kit. There are 6 different tubes or 3 pairs of different sizes. These can be installed around the chassis of your car in different locations to give a 360-degree glow. The major downside, though it is something you can live with if you plan a clever installation, is that the tubes aren’t very flexible. This is the price you pay for getting waterproof tubing. They compensate for this, however, by coming in a large number that you can easily fit around your vehicle. These LED underglow lights are also very easy to operate and come with a control box that you mount on your dashboard and can also be operated via remote control. This lighting kit has a few things that work in its favor, and you’re absolutely going to love them. The very first is the fact that the kit comes with all colors. 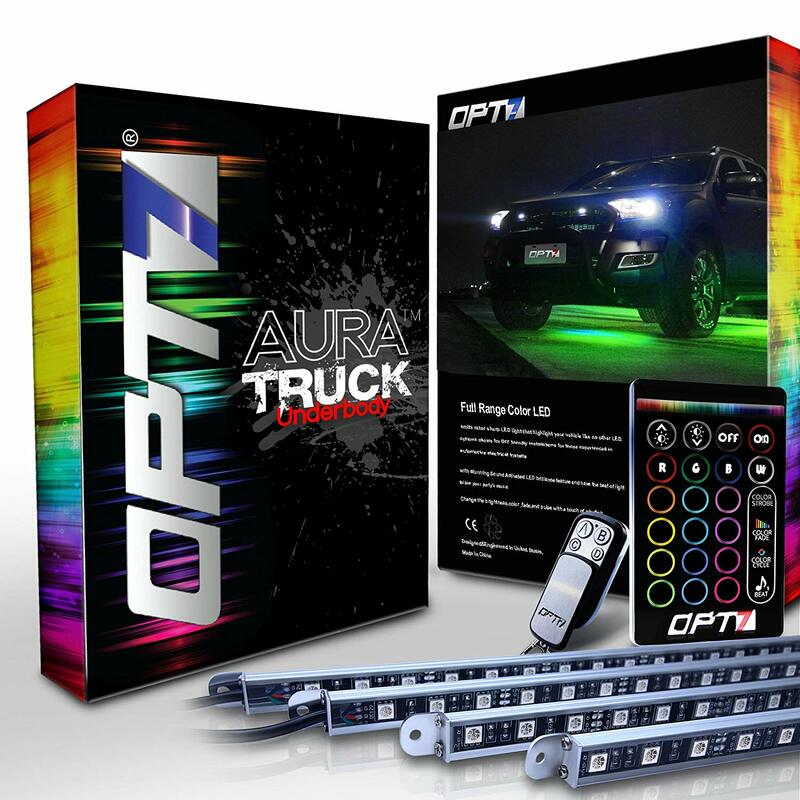 This is something you should always be looking for when it comes to underglow lighting kits. You want something that is capable of lighting in all colors of the spectrum – at least all visible ones. Remember that little thing we said about the ability of light to set the mood? Well, if what you’re looking to do is set the mood then you want to have as many color options as possible with which to set the mood. The OPT7 Aura All-Color proudly does that. In fact, the people behind this brand are so proud of this fact that they have included “All-Color” in the product name. Something else that we absolutely love about this product is how versatile they are. These underglow lights will fit on pretty much any vehicle. 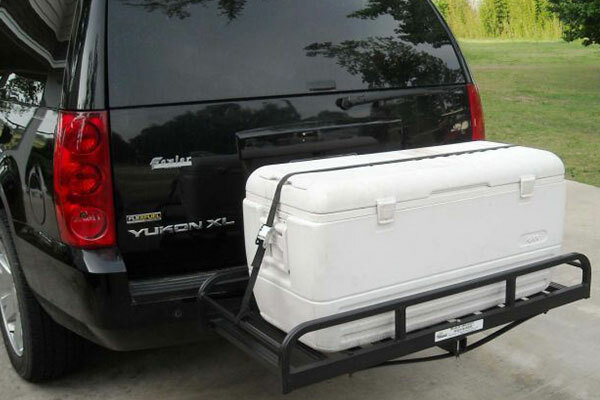 It doesn’t matter if you have an SUV, a van, or a truck – the kit will fit on it. It comes with all the mounting hardware you’re going to need to carry out the mounting in a professional manner, making it an excellent choice both for DIY enthusiasts and garage owners who fit underbody underglow kits professionally. That said, if you’re going to be fitting the kit yourself, you should make sure you’re good with electrical mounting and wear the correct safety equipment, such as electrician’s gloves, when performing the installation. All in all, it’s an excellent kit to have on your car. Here is a lighting kit that offers you features you will seldom find elsewhere. We love the fact that it comes with over 120 preset programs. You might be wondering what that means. It means you can show off tons of lighting patterns of varying levels of complexity with this underbody underglow kit. Other drivers on the road will be right there, watching with their mouths agape. Some of them will commend you. Be modest and say thank you with a smile. Some of them will ignore it and pretend they didn’t see it. Don’t blame them about it; not everyone is capable of appreciating something awesome when they see it. Some of them might even go as far as trying to compete with you. These are the ones you should worry the least about, because no matter how hard they try they will never be able to outshine you. The length of tubing you get with this kit is a whopping 192 inches. That is more than enough to wrap around your car and give people a rolling light show, the like of which they have probably never seen before. The LED lights on this fixture are capable of producing many millions of different colors, being able to transition between them ever so subtly. When we say this is a lighting kit for the masters, we really mean it. Get one, slap it to your chassis, and watch the faces of the other drivers glow green with envy, partly because they actually are envious and partly because the green glow from your underglow kit is lighting up their faces. Okay, throughout this post so far, we have been unduly focused on vehicles. We’ve been talking about underbody underglow kits for cars, vans, trucks, and the like. We’ve been rating each underbody underglow kit on the list based on its ability to be used with these vehicle categories. The thing, however, is that these are not the only vehicle categories out there. What if you want an underbody underglow lighting kit for a different kind of vehicle? What if you want an underbody underglow kit for a gold caddy? 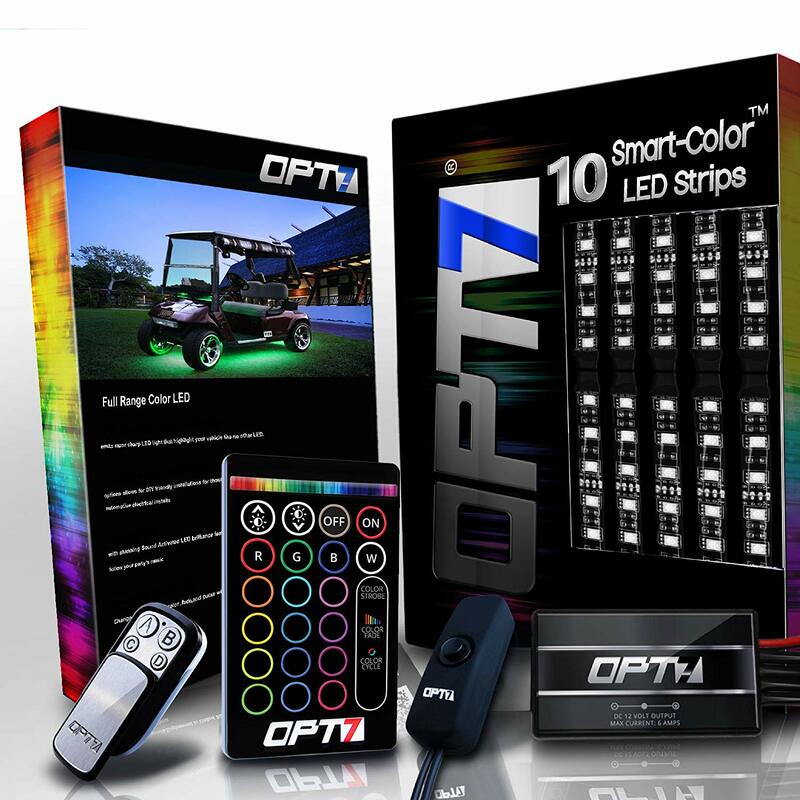 The good designers at OPT7 were pretty much thinking the same thing when they came up with this underglow lighting kit for golf kits. Why do you only get to shine on the road? Why not do it on the golf course? We all know how stuffy those country clubs can get. Why not make them a little more excited by bringing some light shows to the 18-hole parade? That’s pretty much what these lighting kits do for you. They allow you to make a lot of visual noise in a place that has become rather unduly fixated on visual silence. That said, there isn’t much this lighting kit can do for you if you have a car. For starters, it only has 16 colors, which is infinitesimal when compared to the millions of colors offered by the other kits on this list. This underglow lighting kit is what you go to when what you really want, more than anything else in this world, Is to blind other people on the road, regardless of whether they are onlookers or other drivers. Let’s start with the fact that the kit comes in with 10 units. 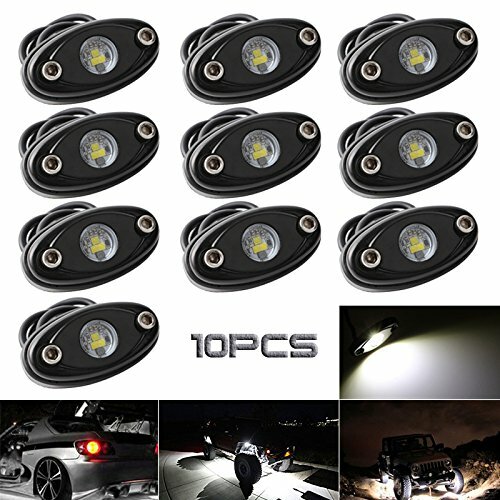 These are some of the brightest LED lights you will find anywhere, and they come in 10 units. That means you can pretty much get the lighting wrapped around your entire vehicle and dazzle other people. The lighting units aren’t in the form of strips, rather they are in the form of little spheres that you can easily attach to the vehicle. They also have a few other interesting features. One of these features is the beam angle. Now, the beam angle is something you don’t want to overlook when you’re dealing with a lighting fixture. The beam angle is basically how wide the light spreads from the source. When the beam angle is wide, then the light will easily illuminate the road beyond the underside of the vehicle, making it look like the car is a little bulb moving down the road. On the other hand, with a low beam angle, the light will only glow beneath the car and won’t be that much spectacular. The beam angle on this lighting kit is a whopping 120 degrees, meaning the light will be able to illuminate just about everything on the ground around your vehicle. 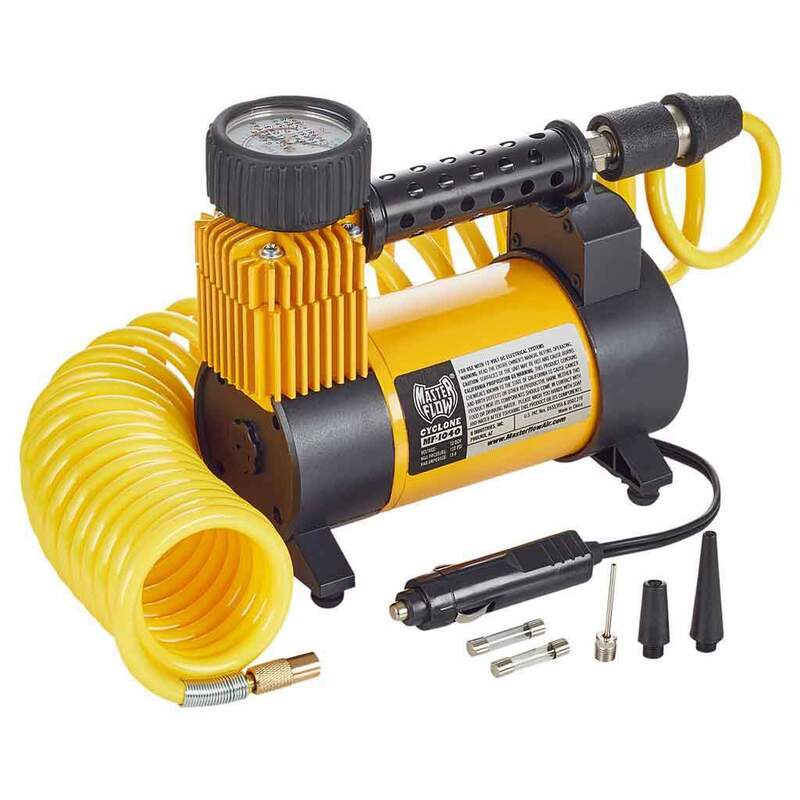 You will also love the fact that this lighting kit is resistant to both shock and dust, making it a great choice no matter what the conditions and a durable option too. The downside is major, however: the lights won’t change color. Remember when we said there are two kinds of underbody underglow kits and we mentioned neon kits and LED kits? Well, here is a neon kit. The thing about neon kits that we didn’t mention before is that they only come in a single color. The sure are bright, illuminating the road you drive on and everything that is on it, but they will only illuminate it in one color. That said, the colors come in a wide range of selections and you can always go for something that tickles your fancy. The XKGlow Neon Accent is designed for those who want just one color under their vehicle. If you want blue, then you get the most vibrant blue you could possibly get for your vehicle. If you want green, or amber, or pretty much any one of a wide range of memorable and bright hues, then you get them. The beauty of this kit is that it really does a lot for the aesthetics of your vehicle, despite its limitations. You will definitely appreciate it, and so will onlookers. Additionally, the kit has another advantage that you rarely find with neon underbody underglow kits; it’s bendable for use under the bumper, making it perfectly capable of conforming to the natural contours on your vehicle. We have a soft spot for this kit, despite our reservations about neon underglow kits. If you’re a specific type of driver, with a specific color preference and a specific mood that you’re going for, then this kit will be perfect for you. Sometimes what you’re looking for when you get an underbody underglow kit is a simple kit that does the job. It doesn’t need to have all the bells and whistles and it doesn’t need to even have all the colors. At the end of the day, what an underglow kit does best is it glows. This underglow kit certainly does that. It glows from glorious beginning to glorious end and everywhere in between. In fact, it’s so good at glowing that it comes with 8 pods, each with 3 ultra-bright LEDs. Now, the very first interesting point you notice about this underglow kit is the fact that it comes in pods rather than strips. We all know how there is something of a preference for strips in the industry due to their versatility and flexibility when it comes to bringing out the natural curves of your vehicle. To be entirely fair, pods should be better than strips at the specific job of bringing out the natural curves of our vehicle, so long as there are many of them. You can think of pods as point lights that are a certain distance apart. The more of them there are, the smaller the spacing and the smoother the look, which brings us to the second thing we notice about this LED kit; there are only 8 pods. That means you only have so much room to work with when giving your vehicle the underglow of the century. The great draw with this kit is the fact that you’ll feel safe with it, no matter what the terrain. The housing of the LED lights consists of aluminum and very tough glass. That way, the lights can survive against all kind of debris that comes up at them, on and off the road. Here is yet another scion of simplicity for those who want something that ultimately does the job without adding in too many bells and whistles. 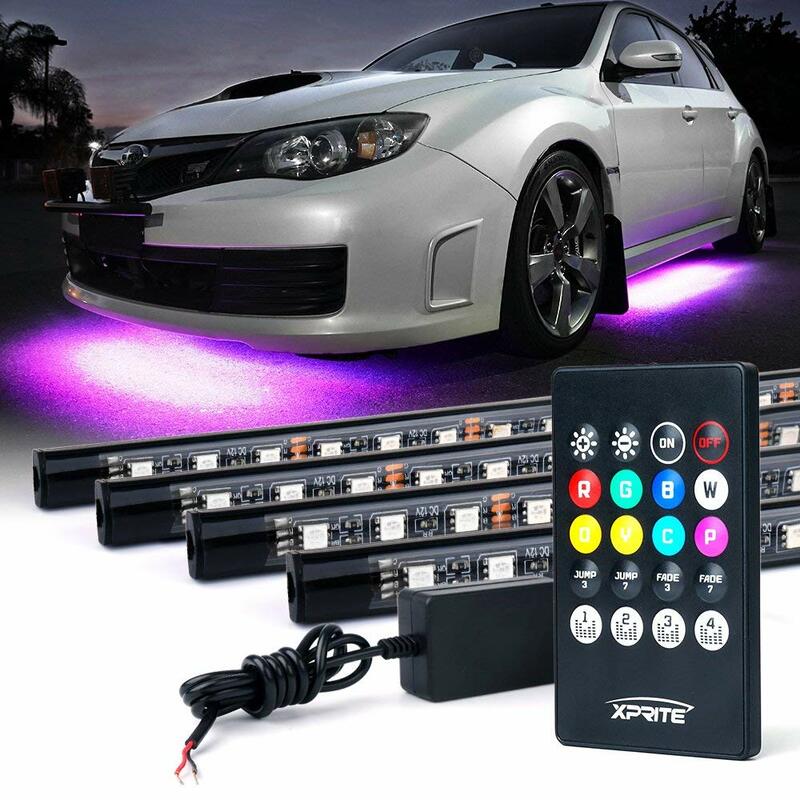 The Xprite 7 color underglow kit is just that kind of underglow kit. The kit itself runs on 12V and consists of 4 strips. 2 are 2.36 inches long while the other 2 are 2.48 inches wide. Meanwhile, they are also 3 feet long and 4 feet long, respectively. While that isn’t the longest kind of strip you will find in an underglow kit, it is fairly long and will be good enough for most vehicles. The tubing is quite flexible, meaning it will easily be able to wrap around the contours of your vehicle to bring out the curves nicely. It’s also waterproof for those wet nights when you need the lights to work without having to worry about them going out. The performance of this underbody underglow kit is pretty simple but pretty good at that. It says “7-color” on the name, but it actually has 8 preset colors, if you consider white to be one of them. These aren’t dynamic lights, though. There isn’t going to be any kind of smooth and fluid transition between them. The effects are basic but functional. 4 lighting effects come with the kit right out of the box. 2 are jump effects, for when you’re in a decidedly staccato mood and want the world to see, and 2 are fading effects, for those times when you want your transitions to be smooth; at least, as smooth as a kit with static colors can allow. There is a simple on and off switch for all this and the LEDs brightness is adjustable, which is a welcome feature in any kit. The remote also happens to conveniently work for up to 100 feet, which is actually pretty good! We lightly touched on neon and LED underglow kits in the mini buyer’s guide, but we didn’t give them enough of the kind of in-depth treatment they deserved. That’s what we’ll do in this section. These are the two main types of underglow kits available on the market. For the longest time ever, the go-to kit was the neon type, but they have slowly ben overtaken by LED lights. We’re going to find out why. They’re called neon tubes, but the truth is that they don’t only use neon to light up. They could use any of a group of gases known as noble gases. Neon is just one of these and is known to produce a red light. For other colors, there are other gases. Helium will produce a yellow light, argon will produce a red or blue light, xenon will produce a green or blue light, and krypton will produce a yellow or green light. It’s possible to achieve even more colors, simply by staining the glass on the tube with different colors. LED is a more recent player on the scene than neon. As such, the initialism “LED” stands for Light Emitting Diode and is a literal reference to the method by which LEDs produce their light. The light from a strip of LEDs will come from dozens of little diodes that together form a surface of light. LEDs are very popular as lighting devices, and their use goes way beyond their application in underglow kits. 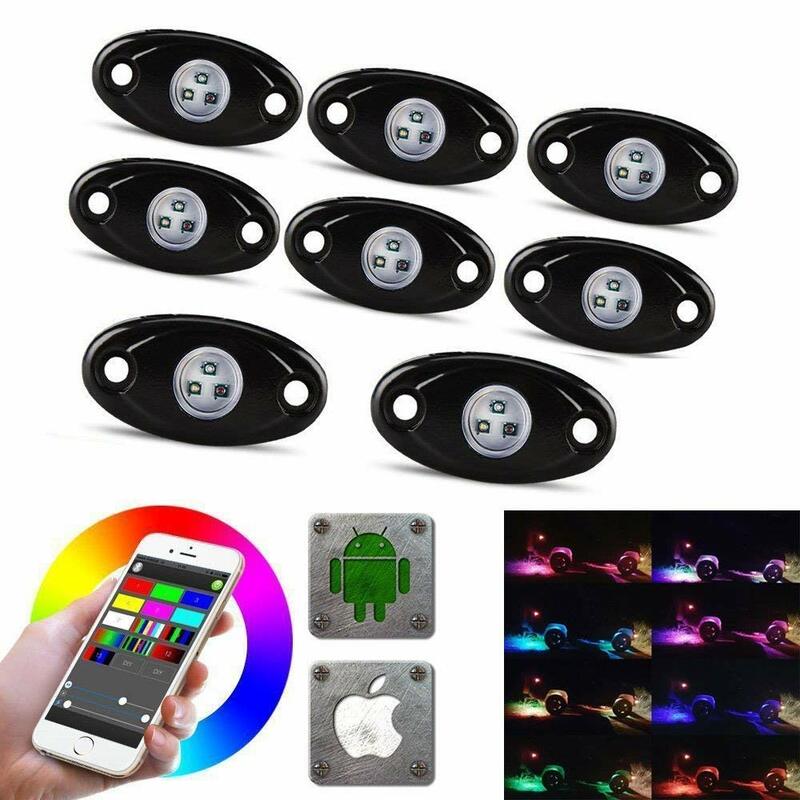 They are used in just about everything that needs lights from lightbulbs to mobile phones to billboards to traffic signs to cameras to remote controller to pretty much anything else you can think of. Even the headlamps and brake lights on cars today are made of LEDs. It was only a matter of time, therefore, before they took over the underglow scene. To truly get a grasp on which of these two is better, it would make the most sense to look at each of their prominent features, one by one. Here the clear winner is the LED kit. These kits will consume over 70% less in terms of power than neon tubes, which makes them highly efficient and a lot kinder on your car battery. Of course, if you want your battery to last longer between charges, then it would be a good idea to get an LED kit. The main reason why neon tubes consume so much power is that most of it is wasted in the production of heat, rather than light. Not only does this heat lead to unnecessary power consumption, but it also leads to very hot tubes. For your underglow system, however, this isn’t as much of a safety issue as it is a power consumption issue. When it comes to the brightness, the LED kit leads, though in a bit of an unimportant way. The LED is capable of achieving more illumination than the neon kit. This isn’t very important for an underglow kit, however, because both kits produce sufficiently bright light to illuminate the asphalt under your vehicle. When it comes to the characteristics of the light, things get a little more interesting. The light that comes from a neon tube is much more vibrant, warm, and soft. Meanwhile, LEDs have more saturated colors which glow brighter. This is a disadvantage of LED, but it can be taken care of when you dim LED lights. Also, a compensation for the disadvantage is the fact that LEDs are capable of producing millions of colors. A neon underglow tube will only be able to produce one color at a time. That means you should know which color you want before you go and make a purchase. Once you’ve installed the system, you won’t be able to experiment with different colors without doing an overhaul of the whole system. Another advantage that neon tubes have historically had over LED tubs is the evenness of the glow. The glow from a neon tube will be even over a wide area. However, there have been numerous improvements to LED technology over the years so that LED lights can also illuminate a wide area with no dead spots. LEDs are also capable of flashing and fading. Be warned, however, that this might be illegal in the state in which you live. Always consult the law before you install a flashing underglow kit. When it comes to lifespan, the results are slightly mixed. An LED light will typically last for about 50,000 hours, or about 5 years or more. Neon, on the other hand, lasts longer – about 8 to 10 years. This, however, is diluted by the fact that there are other components of the kit, such as the transformer, that will last roughly 5 years. Don’t worry about it, though; 5 years is a pretty good amount of time to have an underglow kit. As for durability, neon tubes are more prone to damage than LED kits, which are shockproof. Neon tubes are made of glass, which can easily crack or shatter from small rocks and other debris. 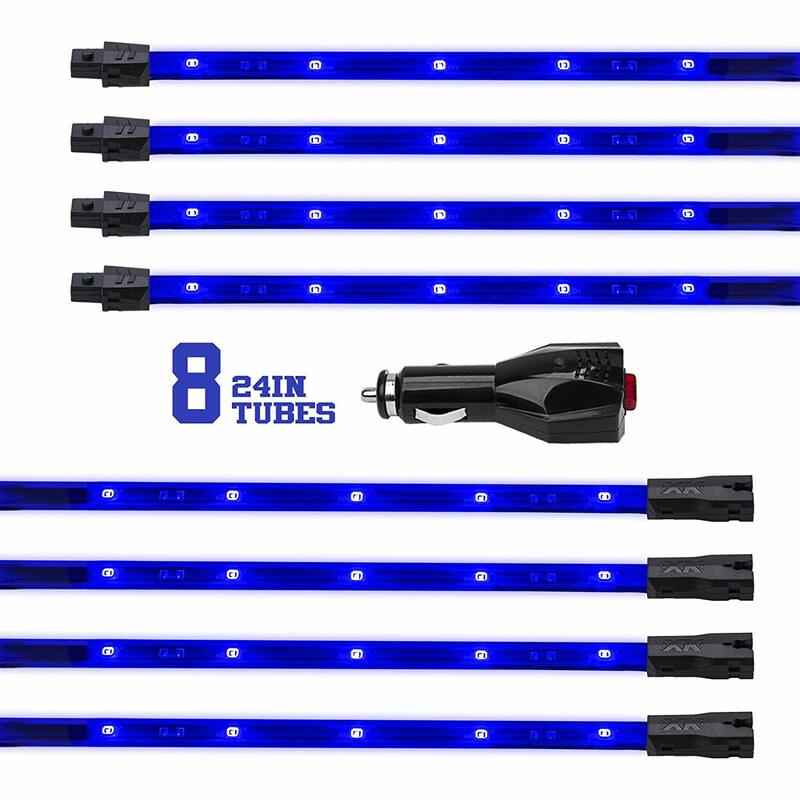 If you’re driving on rough terrain, your neon tubes are in more danger than your LED strips. Once your neon tubes crack, they are done for and need replacement. Your LED strips can take a lot more and still work. Even when some diodes are damages, the others may still work. It takes more time and expertise to install a neon underglow kit. These tubes are easily damaged and so you need to be more careful during the installation process. You should also take care to connect and attach them properly. If they aren’t steady then potholes or rough terrain may damage them. LEDs are a lot easier to install, being plug and play for the most part. All you have to do is mount your lights, make the connection, and switch on the power. It’s easy and fun to do it yourself. Neon is more expensive due to the cost of production. LED is a lot cheaper. 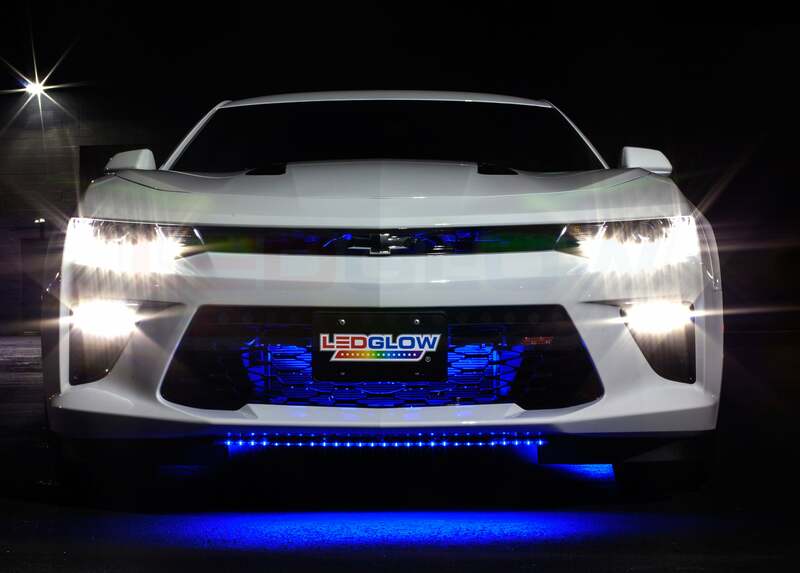 LEDs are your best bet for your underglow kit and will give your car a great glow at a low cost and with better durability. They also have more effects, which makes them fun.